A strange "faster-than-light" experiment could help astronomers study distant objects like NGC 2261, a fan-shaped cloud of gas and dust that is illuminated by a star at its base. An experiment that creates the illusion of an object traveling faster than the speed of light could be a real-world tool for studying the cosmos, according to research presented this month at the 225th American Astronomical Society meeting in Seattle. Nothing can travel faster than the speed of light. Robert Nemiroff, a professor of physics at Michigan Technological University, doesn't dispute that fact. But he does have an idea for a scenario in which something would appear to travel faster than the speed of light to an observer. Appearances can be deceiving, but in this case, they may also have practical applications. For example, imagine a room with a ceiling 50 feet high and walls 50 feet wide (15 by 15 meters). Suppose you lie on your back in the middle of the room with a laser pointer, which you shine upward so you can see the tiny dot on the ceiling. Now you move the laser pointer from left to right across the ceiling. To do this, you only need to move your hand a few inches — but in the short time it takes you to do this, the point of light on the ceiling travels 50 feet. Move your wrist very quickly, and the point of laser light may easily travel 50 feet in half a second — an equivalent speed of 68 mph (110 km/h). Now, expand this scenario to a much bigger scale. Imagine that the room were many miles tall and wide. Imagine the laser pointer were a much more powerful beam of light. The point of light projected onto the ceiling could effectively move at hundreds of miles per hour. Isn't it possible that, in a sufficiently large room, the point of light could appear to move faster than the speed of light? Nemiroff said this is possible, and no laws of physics would be broken. Einstein's theory of special relativity says it is impossible for an object (like a single photon of light) to look as though it is traveling faster than the speed of light. Nemiroff's experiment doesn't break this physical law because the laser pointer produces a stream of photons, not a single photon. No single photon in the stream ever moves faster than the speed of light, but collectively, they can create the illusion of faster-than-light travel. Another way to understand this illusion is to imagine an electronic ticker tape, which creates the illusion of a word moving horizontally across the screen. In reality, the word is created by a series of flashes from many individual, stationary lights. In theory, it would be possible to have a word move across the screen faster than the speed of light — because nothing has actually moved. Each flash of light is an isolated event, and they only create the illusion of movement collectively. This is the first part of Nemiroff's thought experiment. Now, imagine shining a laser pointer straight out into infinite space. You don't see the laser dot projected anywhere because there is no end to this room. Now, imagine you are shining the light parallel to an infinite wall. Turn your wrist so the laser pointer intersects the wall. At what point does the laser pointer intersect the wall? It can't be at infinity, because that would take infinite time. But it also can't be right next to you — it has to be at some point between you and infinity. But according to Nemiroff, if you choose a finite point where the light should be, the beam must always be just beyond that point, one step closer to infinity. In fact, the spot of light must always be in two places at once. Because the photon must be in two places at once, Nemiroff explained, something very bizarre happens: Two points of light appear on the wall, moving in opposite directions — one away from you and one toward you. One point of light is traveling more slowly than the speed of light, while the other appears to be moving faster. (As with the laser pointer projected onto the ceiling, this is an illusion. It is not a single photon traveling faster than the speed of light.) This creates a burst of light, which Nemiroff calls a "photonic boom" because it is similar to the sonic boom that occurs when an object exceeds the speed of sound and overtakes sound waves. Nemiroff provided the technical details for this scenario in a paper that is now available on the preprint website arXiv.org. In the paper, Nemiroff argues that these photonic booms exist in nature. Instead of a laser pointer, these photonic booms might be created by other bright sources of light like pulsars, which are collapsed stars that create very bright, steady beams of light. "Photonic booms happen around us quite frequently, but they are always too brief to notice," Nemiroff said in a statement from Michigan Technological University. "Out in the cosmos, they last long enough to notice — but nobody has thought to look for them!" Rosanne Di Stefano of the Harvard-Smithsonian Center for Astrophysics, added in the statement: "The concept, although not proven in practice, is quite intriguing,"
Rather than an infinite wall, a photonic boom would appear when a beam of light moves across a spherical surface with depth contours, like Earth's moon, Nemiroff said. According to the statement, "details of the effect hinge on the interplay between the time it takes for a sweeping light beam to cross an object and the time it takes for the light beam to traverse the depth of the object." Therefore, if the moon were just a flat disc, a photonic boom could not be created across it. 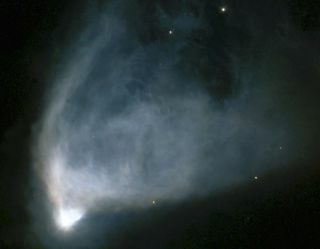 According to Nemiroff, photonic booms could potentially be seen in NGC 2261, also known as Hubble's Variable Nebula: a fan-shaped cloud of gas and dust that is illuminated by a single star at its base. The shadows created by the light of the star passing between the clouds of gas and reflecting off the dust could "create photonic booms visible even for days or weeks," according to the statement.